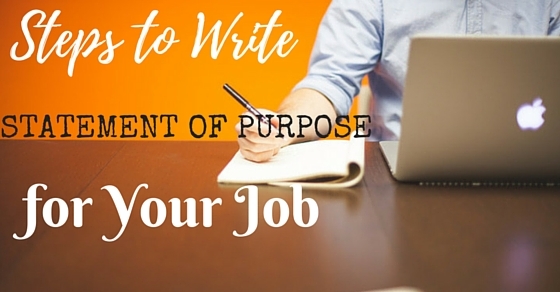 How to Write a Purpose Statement for Your Job? A statement of purpose is something which defines the reason behind what you wish to achieve in life as your goal. Most of the time, it happens that you are not able to figure out the reason for performing some task. When there is no purpose behind anything, the outcome is always not too good. This is because you do everything without any motive which drives you not to perform well; hence the result does not match the expectations. The statement of interest example for job is written following some steps. The ways on how to write a great statement of purpose is defined below. What is Purpose Statement for a Job? Well, a statement of purpose can be for anything, like about your business, your life, your role model in life, a trip, a relationship, a job purpose and so on. The statement of purpose is basically to motivate you from time to time in the journey of life struggle. The most important thing is that you are able to make even a less important thing into the most vital one. Just ask yourself once if ever you have questioned yourself regarding why doing a particular thing. Most of the time, no one asks this question and due to the lack of the urge to know why, the outcome is often not what is always expected. Being purposeful in life makes the life more interesting and fruitful. So, the same goes for the job. When you are not concerned about what are you doing, then there is no point performing such thing. So, the statement of purpose is basically to let the interviewer know the eagerness and also the madness towards the thing. This would help you grow in the job. Also the purpose behind the work will be fruitful. Therefore, before making an original, start writing a sample statement of interest for employment. A very clear articulation of your goal and interests. Interest and fit with the program. Proof of past experiences and success. How to Write a Statement of Purpose? The statement of purpose reflects the main idea behind what you do. So, it must be as forceful and impressive as anything else in the world. The statement of purpose should not be actually a statement but it should be more than that. Just for an example, would you like to read a novel just with a statement or a single line? No, not at all. So, same is the case with the statement of purpose. One liner will not do any good. You will have to explain properly the reason why you want to do a particular thing and what exactly drove you to pursue and follow such dream or aim. Your stories would be good to read rather than just a single line. Even if you are asked to write down a story about the statement of purpose, that does not mean you have to pen down thesis. It’s just that you have to be apt in what you write but it should not be short to the extent that it finishes the moment you start the line. So, make sure it is lengthy enough to engross the reader but also not that much lengthy that the story becomes never ending. Do, keep such thing in mind while writing statement of purpose. Whatever you write down should sound positive. It is just for the sake of spreading positivity. You must write in future tense that you “will” do this or that. Do not write in a manner that sounds you yourself are not sure of what you are doing. Just say that you will do, as it puts a positive impression on the reader. It also raises the chance of getting promotion at job if you are experienced. Being specific means that you should focus on one aspect at one time. You should not write anything just to increase the length of the statement of purpose. Just focus on one thing and write about that only. For example, if you have interest in production work, then write about that only. Write in specific manner stating the purpose of what you want to do. This will showcase your interest and also the excitement to do the job. Pen down all the expectations that you have like related to your job in the company. Examples of expectations means your wants, needs, and even fears must be mentioned. If you are writing a purpose statement then make sure you answer some of the important questions like, what do you exactly want? What do you really need with the job? And what fears do you have regarding the job? Ask and explain clearly about your misunderstandings because these misunderstandings only lead to greater issues. When you are going for a job interview. You will be presenting a statement of purpose. So, professionally saying it should not have any grammatical mistakes. If it will have any errors, then it will cause you a great problem. So, it is better not to make any silly mistakes as it will only make you loose the opportunity of getting a job. These minor things should be taken into consideration while writing a statement of interest for a job. You need not explain about any company or the manager in that. The statement of purpose reflects who you are. So, you must write in it about yourself only. No matter how self obsessed you have to be, just be it as it is the need while writing a statement of purpose. Just tell what you need, what are your desires and how you will be achieving those. You may even write about the hobbies and your interest in the statement of the purpose. This is necessary because when you mention the hobbies, it makes the other person think that you are not only a professional person but also are fun loving and lively and also work for you interest apart from your profession. The more good you will tell about yourself, the more it will be good for you and your chances to grow. You never know, you may even get promotion in the job. The sentence formation should be correct. It should not be wrong. What you write should make sense and also try to write what exactly you think. Often it happens that you fail to write what you think just because of lack of words or lack of writing skills. Once you write, make sure you get it checked to someone before finalizing. It will be a great idea because if you will take a statement of purpose full of errors, then it will caste a wrong impression on the interviewee. When you write a purpose statement for your job, do not write anything in past like you had already done this and that. Yes, it is fine to say that you have achieved the particular achievements but make sure you do not write that you wanted to do this thing but some how you could not do. This is because, it will put a negative impression that you might have left some stone unturned and that is why you could not achieve what you wanted. The lines and the words should not be repeated; afterall you are writing on professional front. Instead of repeating the words, you can make use of the synonyms. That looks more appealing and gives a professional touch to your statement of purpose. Also, when you pen down the words, be very carefull with that as a single wrong word could make a huge change in the sentence and it’s meaning. See, the statement of purpose is for proving your potential so, it must not contain anything which you never wanted to do in life. Just talk about your dreams, passion and how will you follow them. If possible, you may even tell in one or two lines about the blueprint or the plot you ever had in mind in order to be successful in life. Basically, the statement of purpose is to get a job, so make sure the current aim of getting a job is fulfilled. You need not explain the irrelevant stories in the statement of purpose. Just be very specific and write to the point, thinking what is important and what not is to be mentioned. So, above are some of the points that one must keep in mind while writing down the statement of purpose. Previous articleHangover at Work – How to Survive With it?